The Velocity™ single wafer product line is focused on improving defect removal. 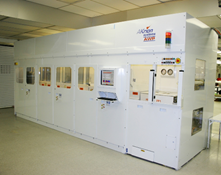 This includes the removal of particle and residue contamination from the wafer’s front side, back side and edge. Defects are removed without physical damage to sensitive structures and without film etching. This is accomplished using advanced physical clean technologies – Goldfinger Megasonics, Jetstream Nano and Backside Megasonics. The GAMA wet station series is a proven performer with hundreds of systems installed worldwide. A modular, flexible platform allows highly customized processes to meet the most demanding criteria. The system adapts to applications for both front-end-of-line and back-end-of-line process steps and accepts a wide variety of substrate materials. 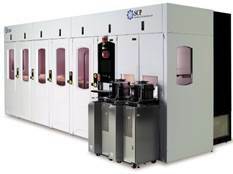 GAMA features closed loop process control to ensure consistent high quality to promote high yields for all wafer sizes. 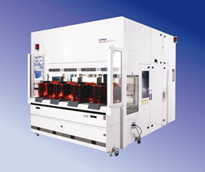 V3 is the next generation of Semi-Automatic wet benches targeted to meet the needs of Semiconductor and MEMS companies who need the process capability, recipe flexibility, equipment reliability, company support and knowledge to back up a successful installation of the product. 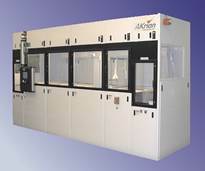 The system is particularly well suited to R&D and process development and for low volume manufacturing. NAURA Akrion offers a full line of wet processing solutions to support the needs of solar cell manufacturers using crystalline silicon wafers. Our systems incorporate the technology and platforms that we have developed in 20 years of engineering over 1400 wet processing systems. We have taken this knowledge and developed equipment and process solutions specifically geared to the needs of solar cell manufacturers. Extend capital funds – buy used or refurbished systems for big savings. Flexible solutions to meet your budget need ranging from installing equipment “as is” to…. fully refurbished, process qualified systems with one year parts and labor warranty. These systems are subject to availability.